I am just an incurable romantic when it comes to Christmas. In Holiday Blessings, I wanted to convey the family atmosphere and the warmth of home contrasted with the cold blanket of snow. Even the snow is warmed from the lights spilling out of the windows onto the lawn out front. 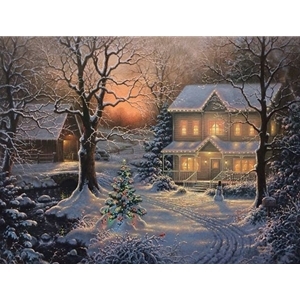 Just as the warmth of the home in Holiday Blessings draws us toward the home, so does the warmth of God's love draw us to Him. I chose the warm light of the barn and sunset to draw you into the painting. I wanted to have a cardinal to add color and interest to it. Soon family will gather for a Christmas meal and enjoy all the blessings of the season. We should never forget the reason for the season is to celebrate the birth of Jesus. I hope you enjoy this new painting, and I hope that it brings a sense of warmth, joy, and comfort to your home as you enjoy all the Holiday Blessings.